God created a plan for my life : master-plan. He thought through every moment, every detail. The question is did I follow His plan, or did I deviate and travel my own path? Somehow, I believe since He is all-knowing God who knows my future, that he weaved even my sins and mistakes into His plan so that He could fulfil the promises of Romans 8:28. He knew the path I would take, every mistake, every sin, and every failure. He took those broken pieces and weaved them into the fabric of my life. When I thought calamity, he thought lesson and a chance to overcome in Him. When I thought calamity, Jesus thought lesson and a chance to overcome in Him. He turned my worse days into blessed days. He created an over-comer. He created a thankful heart in me. The thankfulness never immediate, but it did flood my soul as I looked back and saw how he rescued me from even deeper failure. Yet, even now in my present storms, I cry out the promises of these two scriptures. I cling to them like a lifeboat. The waves may crash, the thunder boom, and life storms surround me, but my rescue is at hand. I just have to hold fast to His promises. No matter what my outward circumstances look like, victory is on the way. My failure will turn to blessings. My sin and mistakes transformed to lessons. A light of hope beaming in my darkness. A hand outstretched to lift me up. I just have to meet it and accept it in faith. What kinds of storms do you walk through? Know God is the author and finisher of our faith. He planned our lives throughout eternity. He knew me. He knew you. Jesus planned our lives throughout eternity. He knew me. He knew you. Will you accept the master-planner as author of your life today? The weaving of sin and mistakes into the plan is a great line. Happy Writing! 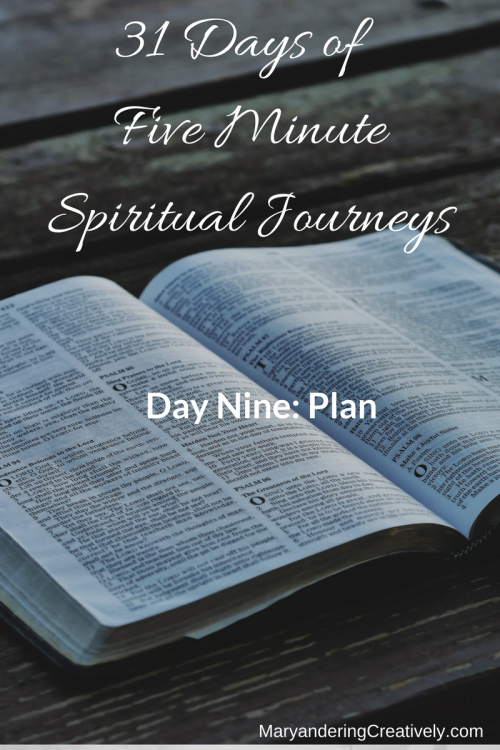 Be sure to read Melanie Pennington on day 9 linkup – God had a different plan for her day! I love reading your words. I am so glad you took the challenge. I agree God work his plan through all of our sins and mistakes. We can always find God’s will even when we take a wrong turn. I like the song too. I love the fact that God is the author AND the finisher of my faith. I’m not a great finisher, so it’s good to know that someone with more wisdom and patience has everything under control! I love this truth: “Somehow, I believe since He is all-knowing God who knows my future, that he weaved even my sins and mistakes into His plan so that He could fulfill the promises of Romans 8:28.” I’ve seen God do this over and over in my life.